Family Fun Riding. Timbersled® Performance. The Timbersled® Ripper is all-new for 2020 and designed for more family fun riding with improved on- and off-trail performance. It is a great entry kit into snow biking designed for all riders, especially those looking for an adjustable ride height for more confidence and control. Now you and your family can ride together and build memories to last a lifetime. FAMILY FUN RIDING: Build memories to last a lifetime. 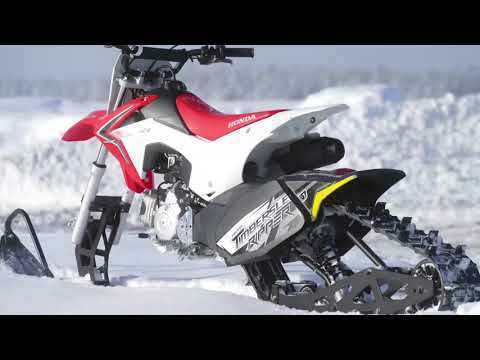 Designed for 110cc dirt bikes, the Timbersled® Ripper is a great entry kit into snow biking for all riders. TIMBERSLED PERFORMANCE: Perfect for riders looking for adjustable ride height for more confidence and control. RIPPER TRACK & SKI: The 93" Ripper Track was designed with more aggressive lugs to deliver improved traction for confident handling. Experience superb performance on any terrain with a deeper keel on the Ripper Ski in loose and hard-packed snow conditions. DUAL ARM REAR SUSPENSION: Provides improved off-trail mobility. RYDEFX® SHOCKS: When it comes to performance, the Ripper doesn't hold back. This snow bike system uses the full size shock from the ST 120 RAW. These custom valved RydeFX® MPV Motion Control coil over shocks are highly capable an provide a great ride in any terrain for all riders.